This air hoist unit was out of service at the time of Hoist & Winch Ltd's initial inspection following 16 years very hard service in the cement production industry, where it is used to handle heavy duty grinding mills in the coal mill section of the production process. The air hoist unit had been subjected to a very aggressive coal dust atmosphere, which had caused excessive wear to the load chain and severely contaminated all the external components. In addition, the damp main air power supply to the air hoist unit had caused severe contamination to key internal components such as motor vanes, motor cylinder sleeves, disc brakes and control valves. The customer initially asked to replace the existing air hoist unit with a completely new hoist unit but after explaining to the customer the lead-time and costs associated with this process, and also the very small minimum closed hook height dimension offered by the existing air hoist unit, Hoist & Winch Ltd recommended a complete refurbishment of the air hoist unit. After agreeing budget costs with the customer, the hoist unit weighing over 600 kg was taken down to ground floor level and removed from site by the Hoist & Winch Ltd engineering team, using 4- off Yale manual chain blocks and 2- off “T “ Bar design lifting frames clipped to the top flange of the hoist runway beam. Full re–paint of the air hoist unit external components with a corrosion resistant epoxy based bright yellow paint finish as shown in the photograph. On completion of all in house refurbishment work, the air hoist unit was returned to site for installation and on site load testing by the Hoist & Winch Ltd engineering team. 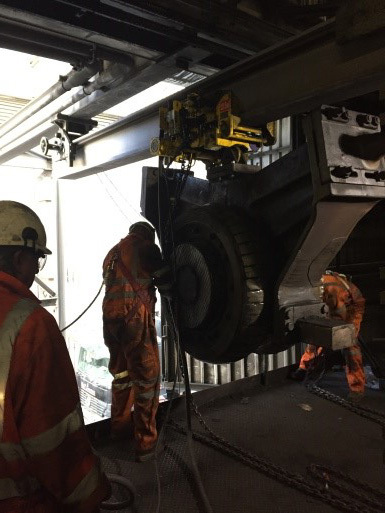 All work was completed within a tight 5 week time frame in readiness for the start of the customers annual shutdown, where the hoist unit was required to remove 2 - off existing and install 2 - off new coal mill grinding mills weighing approximately 11 tonne each. The harsh Cement Industry conditions and resulting closely monitored working practices call for very stringent planning of all work activities and therefore all on site work has to be very carefully documented with Risk Assessments and Method Statements, which are reviewed and agreed by the site engineers before any work can commence. As in this case, at the time of major plant shutdown where up to 300 other contractors may be working on site, all site work is even more closely regulated by CDM Regulations.